"Ow, ow, ow, ow, OW!!! Sweet Plumbob, when will this be over?!" In his private hospital room, Gabriel waddled up and down in agony, clutching his stomach. How much longer was this going to take? Upon discovering he was pregnant, the thought of giving birth had terrified him, but now, he just wanted to have the baby and be done with all this. Katerina watched him from beside the bed. "Not long now, my darling," she said. "They just have to get the birthing suite ready." "Well, they need to do it faster! I can't wait much longer!" Gabriel was sure hours had passed by the time a porter appeared at the door, saying those magical words - "They're ready for you, Mr. Lee Harker." "Thank you," Katerina replied. "I'll take him down." The porter nodded and walked away. "Come on, then," Katerina chuckled. 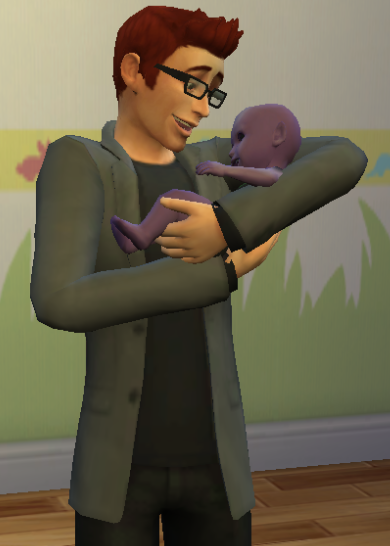 "Time for you to go and have this baby." Gabriel smiled at her, but after a few moments, his expression grew graver. He reached out and grabbed Katerina's hand. "Honey..." he said nervously, "you... you'll stay with me, won't you? 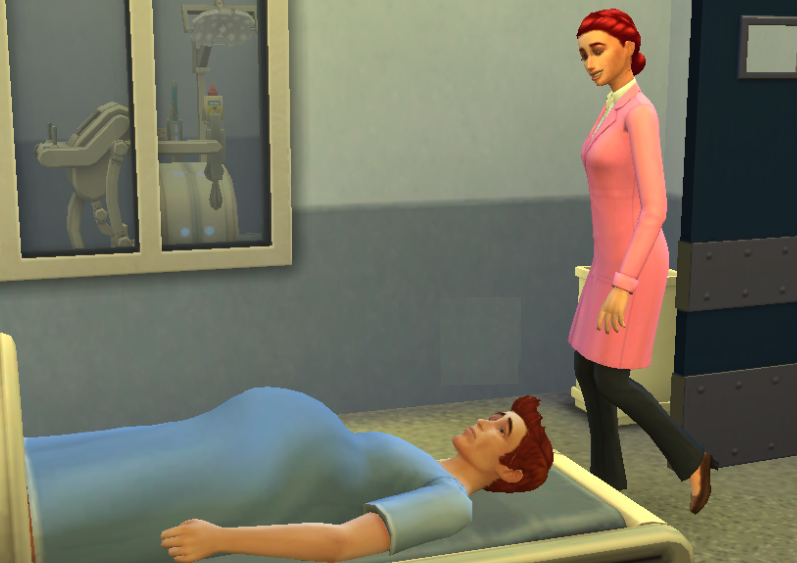 During the birth?" Katerina cupped his hand tightly with hers, and kissed his cheek. "Of course I will, my love. Besides, I want to meet the little one just as much as you do!" The birthing suite contained the latest in hi-tech medical technology: a sight which reassured Gabriel very much. The centerpiece was a large machine, similar in shape and size to a body scanner, that has been specifically designed for delivering babies by C-section. 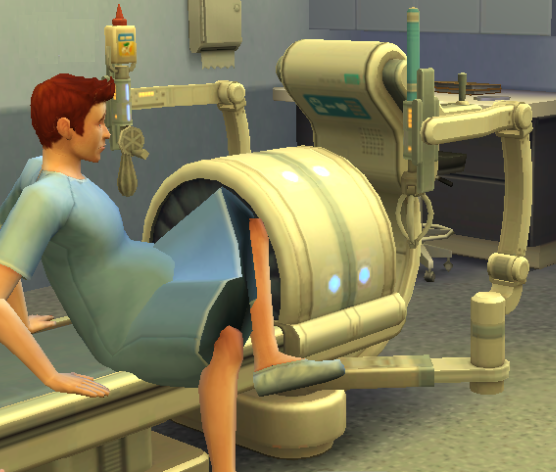 This, of course, was the birthing method that Gabriel automatically had to go for. As he lay down and settled himself into the machine, Katerina stayed nearby - remaining, as always, a woman of her word. "Yes, thank you." Gabriel replied. "Mind you, I'd feel a lot more so if I wasn't in so much pain." The suite door swung open, and in walked a woman in pink hospital scrubs. She noticed Katerina, and smiled. "Hey there!" Dr. Kailani Jimenez said cheerfully. "How are you?" "Fine, thank you," Katerina told her. "I'm a little more concerned about him right now, though." "Of course!" Kailani replied, before turning to her patient. "You must be Gabriel. Nice to meet you. Now just lie back, breathe and try to relax. Your baby will be soon be here!" "Have... have you ever done this before?" Gabriel asked her. "Used this machine, you mean?" Kailani said. "Oh yes - countless times. Mind you, I've never had to use it on a male patient before. But please, don't worry - everything is going to be fine. I promise." As Kailani took her position at the machine's controls, Gabriel drew in a deep breath, fixed his eyes on the ceiling, and braced himself. Katerina knelt beside him and took hold of his hand, grasping it tightly. "As I'll ever be," came the reply. The next thing Gabriel felt was a sharp, pierce sting - a needle being plunged into his body. A few moments later, however, he went completely numb. He suddenly felt very blissful and light-headed. He even began to giggle. "Pain relief," she said. "Very strong. That should keep him nice and calm." Katerina nodded, partially amused, but primarily grateful. Now her dear husband wouldn't suffer in any way. When asked about it later on, Gabriel would not be able to recall what happened over the next few minutes. He faintly recollected a few whirring and slicing sounds, and a strange feeling that someone was doing the dishes in his stomach, but the thing that brought him back to reality was a loud, sharp cry. Turning his head slightly, his vision still blurred from the medicine, Gabriel spotted a thin, pink column carrying a strange, little purple blob, then putting into a glass box a few feet away from him. After a while, his eyesight started to return to normal, only to become blurred again a few seconds later by his own tears. He felt Katerina's lips gently kissing his forehead, as well as the wetness of her own cheeks. There, beside the machine, wriggling away in the hospital cot, was the strangest and yet most beautiful baby he had ever seen. "Congratulations," Kailani told him. "He's a boy." For the first few hours after they returned home, Gabriel wouldn't step away from his son's cot. He couldn't believe what he was seeing. That this beautiful baby was his. That he had become a father. He kept reaching out towards Michael, gently stroking his hair and face - the feel of his soft skin proving that the child was indeed real. Eventually, once he was able to fully comprehend that the child existed, Gabriel picked up Michael in his arms and cuddled him close, savoring every moment of his new-found fatherhood. 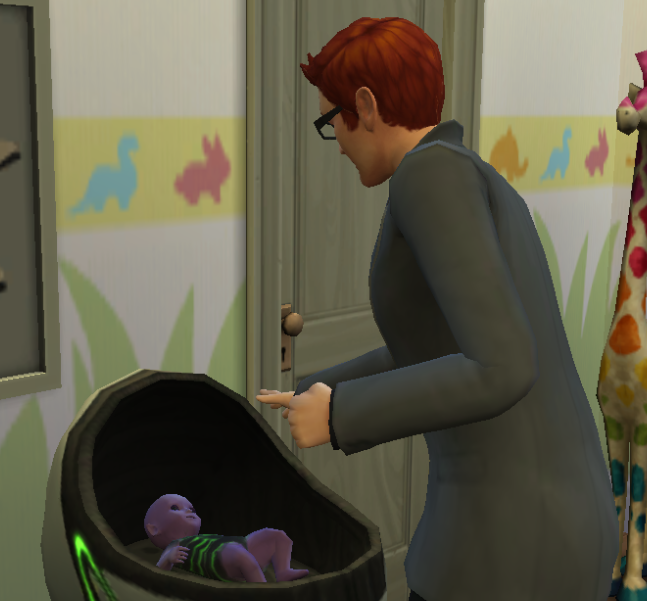 "Welcome to the world, Michael," he whispered. "Welcome... my perfect, wonderful son." Katerina walked in on this little scene, wearing a smile a mile wide. 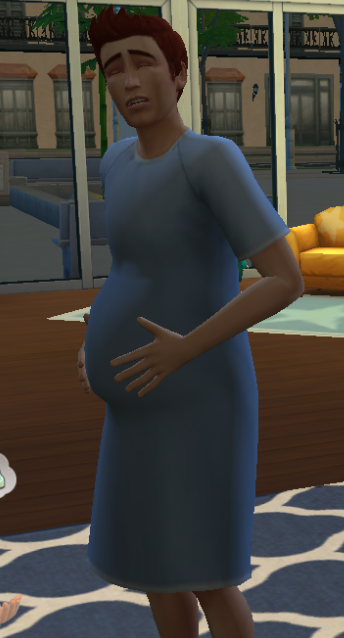 She approached her husband, and looked down at little Michael. "It's Mummy's turn now, darling," she told Gabriel. "Let me hold him for a while." As if passing over a piece of priceless porcelain, Gabriel carefully placed Michael in his wife's waiting arms. Although she'd played no part in this child's conception, Katerina loved Michael as if he had been born of her own body. 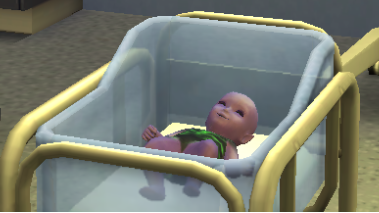 As little Michael began to fidget and squirm, she rocked him gently, singing a sweet lullaby in her native Russian. As he lay in the arms of his Earthling mother, Michael's little eyes began to close, and soon, he'd drifted off into Dreamland. Although he was too young to understand what was being said, a sweet voice called to him as he slept. "My precious son... think of me. Make me proud. I hope, one day, that we will meet again." Over the next few months, Gabriel and Katerina's hearts were flooded with pride as Michael began to grow into a young man. However, whilst it was clear to them that their child was healthy, there were one or two little traits that they found a tad... unusual. For example, whenever little Michael played with his wooden letter blocks, he never built towers or houses. Instead, he would line the blocks up one by one, in perfect alphabetical order. Once, whilst tidying up, Gabriel had made the mistake of putting away the "J" block first, causing Michael to scream the house down. The same thing happened when Gabriel picked up the "M" block, proving it was more than a matter of vanity. From then on, it became vital that the blocks were put away from A to Z in order to keep Michael happy. Then again, Michael never played roughly with any of his toys. He never chewed them, threw them across the room, or dragged them along the floor. Occasionally, he carried them around with him as he toddled across a room, but always held them tightly and carefully. Then, when he was done, he'd put in back in the exact same place he'd found it. The Lee Harkers were astounded to discover that their son was the tidiest, most meticulous toddler ever known. On top of that, there was the books. Michael was utterly fascinated by books. He'd take them off his little bookshelf - one at a time, of course - open them up and study them carefully, sometimes scanning his tiny finger along the pages. Upon discovering his parents' books, he did the exact same thing. Gabriel once saw him examining a large, mathematical volume, and chuckled warmly. "Looking at the pretty pictures, little man?" he called. Michael didn't respond to his father's voice. He was far too busy learning the basics of Calculus. As wonderful as having a son was, and despite the fact they wouldn't swap him for the world, Gabriel and Katerina sometimes missed the old days. They had enjoyed their cosy evenings together - the cuddles and the kisses. Now, all of their free time was spent caring for the little one. "Why don't we hire a babysitter?" Katerina suggested one night, just as Michael was turning two. "We could go out somewhere - have a little fun." "Honey," Gabriel replied, "who do we know that will take care of an alien baby and not go running to the authorities once we get home?" "There's Kailani. She might watch him for an hour or two." "All right. We'll give her a call. But what shall we do?" "Did you ever finish that rocket?" 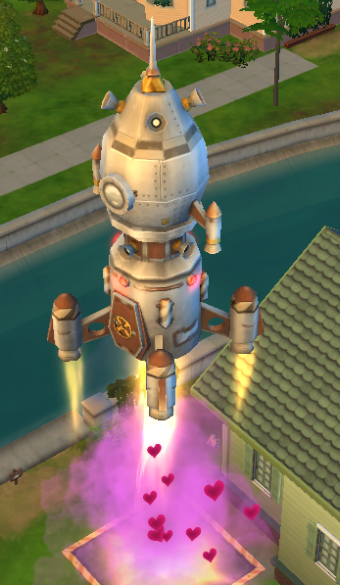 And so, as Kailani kept Michael amused for the night, Gabriel and Katerina went on the maiden voyage of the world's newest rocket, the Great Galileo - choosing to celebrate the journey in a very special way. 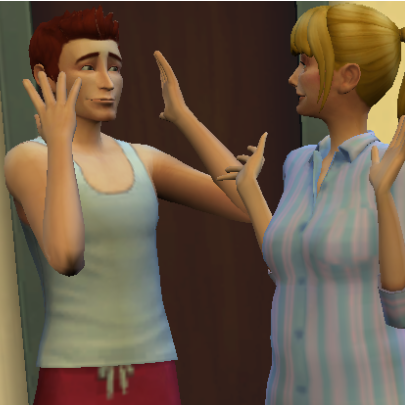 A few weeks afterwards, Katerina gave Gabriel some very special news. He couldn't help but smile. "Don't worry," he told her. "If I can get through it, so can you."